Last week it was announced that scientists have developed a silicon food supplement for poultry, potentially allowing producers to continue, even speed up, the fast growth of modern strains of meat chicken without the associated lameness and skeletal problems. The aim of this feed supplement is to address not only welfare but “economic concerns for the poultry industry”, the researchers stating that this new food science will allow farmers to “increase the production efficiency of the world’s most commonly consumed meat”. Is this really “good science” on factory farms? Rather than striving to change our exploitative farming systems, we’re changing the integrity of the animals so that they fit more comfortably within them. The welfare problems faced by intensively-farmed animals are well documented and, over recent years, there have been attempts to enrich environments to provide these individuals with some capacity for a quality of life. However, for the majority of farmed animals, the captive environment continues to restrict natural behaviors, causing them distress which leads to physical and mental pathologies. Selective breeding for specific genetic traits to increase productivity has been particularly detrimental to animals’ health and wellbeing, as have ‘standard farming procedures’ that improve economic gains but cause physical pain and distress. On the flipside, when traits are selected that benefit the welfare of the animal, conventional breeding or scientific modifications have the potential to help that animal cope with its environment. This post explores not just the welfare effects of using science to change animals, but also the ethical consequences of modifying the animal rather than the environment: ‘sanding the pegs’ rather than squaring the holes. Over the last two decades, behavioral research has confirmed the obvious intuition that an animal’s feelings, including pain, fear, and pleasure, impact the degree to which he or she can cope with their situation. For Animal Welfare professor Donald Broom, this is the very definition of the welfare of an animal: “its state as regards its attempts to cope with its environment”. Yet it’s no secret that the majority of animals in intensive farming systems struggle to cope psychologically and physically, the stress of confinement and restraint of natural behaviors producing behavioral and physical pathologies, while standard agricultural procedures like dehorning and castration cause physical agony as well as mental distress. Ninety percent of caged hens in the US, for instance, allowed only an iPad-sized space, are unable to retire privately to lay their eggs. This natural nesting behavior that has been shown to be more important to a hen than eating after 72 hours of starvation. Social media has given the public unprecedented access to exposés of animal abuses perpetrated on farms, notably recent UK welfare breaches at Red Tractor-assured Rosebury Farm, where workers were filmed swinging piglets against the wall. Yet when an HBO documentary showed Ohio farmers enacting the same acts of violence, as well as using forklifts to strangle pigs, the pork industry claimed this was ‘common agricultural practice’, a defense corroborated by veterinarians and accepted in court. In America, anything defined as a common agricultural practice is exempt from animal cruelty law. These everyday ‘standard practices’ of western farming challenge animals’ freedom from discomfort, fear, frustration, and distress. While veterinarians may insist that animals’ basic nutritional and medical needs are met in our modern farming systems, consider the prevalence of ‘normal’ restrictions on natural species-typical behavior; behaviors shown to help animals cope and, better still, to promote positive affective states. The majority of America’s 5.5 million breeding sows spend their lives confined to gestation crates, unable to turn around let alone socialize or mud-bathe. Feed restriction is a common practice in poultry, dairy cow, and pig farming. The AVMA confirm that animals have been shown to experience negative affective states as a result of these “routine management procedures” which also include hot iron branding without anesthesia and restraint using electroimmobilization. To remove the off-putting ‘boar taint’ of intact meat, castration is standard practice for virtually all 50 million male piglets in America, causing minutes of intense pain and severe discomfort weeks later. Another standard practice is dehorning of adult cattle or disbudding of calves, more often than not conducted without pain management. Even with the use of a local anesthetic, it’s been shown that pain isn’t completely alleviated during or after surgery, unsurprising when we consider what this procedure involves. To disbud a calf, a 600-degree iron is pressed against the head to burn through the nerves and blood vessels that would normally allow the horn bud to develop. Alternatively, caustic paste may be used to chemically burn off the horn buds, making the pain easier to manage – when the burning paste doesn’t run into the calf’s eyes. Equally horrifically, crude instruments may be used to physically gouge out horns or buds, or wire used to saw off horns. As with all these routinely cruel farming practices, the reasons for dehorning are primarily economic: to protect leather and meat products from damage. It’s possible to use naturally hornless (“polled”) breeds but farmers have been traditionally resistant to this because these cattle, particularly in dairy farming, are perceived as less productive. Most intensively farmed animals are restrained and subjected to acute and chronic stressors relating to space and environment, nutrition, invasive husbandry procedures, degree of opportunities to express normal behavior, including social behavior, and also during transportation and slaughter. Unable to remove themselves through natural behavioral responses (i.e., to run away), they instead experience a neuroendocrine response to the stress, an increase in stress hormones like cortisol disrupting their normal hormone secretion. The animal may consequently employ body reserves normally used to regulate key biological functions like immune competence, reproduction, metabolism, and behavior, which means stress can result in a wide array of pathologies, including autoimmune disease, hypertension, failed reproduction, affective disorders and major depression, the animal unable to compensate for the insult caused by the stressor. Modern strains of pigs have larger muscle blocks, more anaerobic fibers and smaller hearts than their ancestors, while some cattle breeds such as the Belgian Blue exhibit double muscling, which means they are often unable to birth naturally, requiring C-sections which are highly invasive. The extra weight all these animals carry means they’re more likely to become distressed, and even die, during normal activity. Our modern-day broilers are similarly products of intensive genetic selection, gaining weight rapidly with minimal food. A 5lb chicken would take 84 days to raise in the 1950s; today, this time period has been almost halved. These birds’ hearts and lungs can’t support their rapid growth and 26-30% of broiler chickens have gait defects that impair their walking ability. The evidence strongly suggests these chickens are in chronic pain. Furthermore, in order to survive long enough to be viable breeders (without becoming overweight), the parent flocks must be denied the food their ravenous appetites seek to support their unnatural growth rates. Hence these birds suffer the constant stress of chronic hunger. The dairy cow is a further example where conventional breeding dramatically improves production but causes extra stress on the animal. The milk yield of dairy cows has risen steadily over the last thirty years, with 50% of this increase attributable to genetic selection for milk production efficiency. The genetic component underlying milk yield positively correlates with incidence of lameness, mastitis, reproductive disorders, and metabolic disorders: more biological resources go into production, and less are available to support normal biological functions such as the immune system and reproduction. Similarly, our domestic hens produce around 300 eggs a year as a result of generations of selective breeding, more than twenty times the egg production of their wild relations. Forming and laying a single egg is an arduous process, taking the hen 23-27 hours, so this hyperactive reproductive system puts enormous stress on her body. Consequently, the domestic laying hen is the only nonhuman animal that spontaneously develops ovarian cancer and she is at risk of prolapse, which can lead to death by hemorrhage or shock. A long-term experiment by Bill Muir at the University of Guelph selectively bred laying hens for super productivity, and demonstrates a further welfare issue in physical selection: the most productive hens were also the most aggressive, the biggest ‘bully’ achieving her productivity by suppressing the other hens. Bullying behavior is a heritable trait and, after six generations, the hens were so belligerent that they literally killed each other. 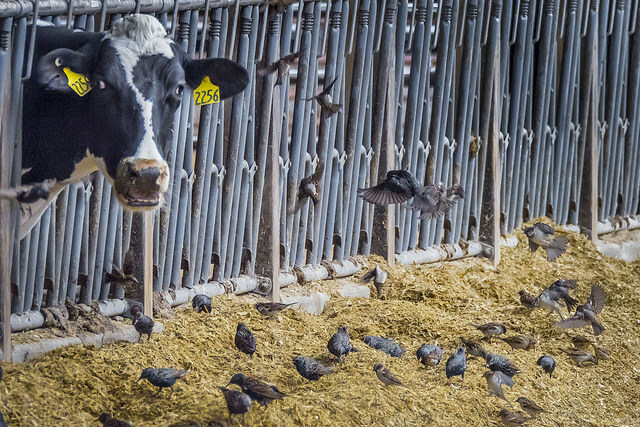 By inadvertently selecting undesirable behavioral traits alongside productivity, the agricultural industry has necessitated poor welfare practices such as beak trimming and isolated housing. Is there “good science” in animal farming? What if we instead breed or modify animals to cope more easily with the stress of confinement? In the past, genetic selection for better welfare has been held back by the seemingly conflicting demands of welfare and commercial production. However, the European Food Safety Authority (EFSA) state that there is an “urgent need” to give more weight to fitness and welfare traits in the criteria used for genetic selection, even when these conflict with selection for food yield. Silicon-pumped chickens are just one example of changing the birds to experience better welfare in modern broiler systems. In 2012, Dawkins and Layton saw the potential to select poultry with high welfare traits without reducing rapid growth rates. They argued that the conflict between good welfare and productivity can be reduced by making use of all available genetic variation from existing breeds. Positive as this sounds, just like the silicon supplement scientists, these researchers only address the physical health of the bird, making no mention of the social and psychological stress these birds continue to feel in overcrowded, artificially-lit, enclosed environments. Lewis Bollard, leading the Open Philanthropy Project’s strategy for Farm Animal Welfare, identifies the biggest welfare issue in intensive farming as the imbalance between the animal’s psychological desire to express natural behaviors and his or her immediate environment. Another use of “good science” to enhance the physical well-being of the animal applies to the cruel practice of dehorning or disbudding that we looked at earlier. It’s now possible to introduce the polled gene into productive breeds like Friesian and Celtic cattle. Many polled cows will carry a second horned allele which they may pass down to their calves; however, new testing can identify cattle carrying two polled genes and guarantee that they can breed with horned cattle and still produce polled offspring. This test is now available at the University of Queensland and can be done cost-effectively as a ‘bundle’ which can be customized for each breed. Most traditional Hereford breeders have introduced the polled gene to their herds in response to commercial preferences. In 2017, 77.8% of calves were born polled compared with 69.7% in 2016, a positive indicator of change. Furthermore, it may be plausible to speed up this process using genetic engineering. Recombinetics are fast forwarding selective breeding to create hornless Friesian dairy cows, this gene-editing company crossbreeding hornless mutations of beef cattle breeds such as the Angus and “turning off” the gene that provides for horns. In the past, public fear and FDA regulations have prevented such animals from entering the food market. However, as regulatory oversight potentially moves to the USDA and gene editing tools like CRISPR and TALEN remove the nightmarish connotations of ‘combining’ animals using transgenesis techniques of old, the immediate creation of hornless cattle might become viable. Of course, stress responses aren’t just related to the physical trigger, whether that be a broken leg or a severed horn. The individual’s temperament is also a key factor in his or her ability to cope. Affective states are adaptive and have evolved by natural selection: domestication of our farmed animals has already resulted in a greater tolerance of environments that would be stressful to wild species. An example is modern dairy cattle production, which discourages maternal behavior (excepting milk production, of course): it’s widely accepted that selective breeding has gradually selected against the strong maternal instinct, reducing the stress of calf separation for the mother. While there has been no good experiment to prove this, John Webster states that anecdotal evidence suggests an Indian water buffalo will not let her milk down unless her calf is present. This indicates that the expression of maternal behavior in cattle that have not been selectively bred is significantly stronger. We can accelerate this process of domestication by artificially selecting and breeding animals that have a reduced stress response to intensive rearing conditions. Selecting animals with a reduced stress response has been at the core of the domestication process in both companion and farmed animals, the selection of less timid or aggressive animals for breeding resulting in smaller adrenal glands that are less active. The tamer the animal, the less active the adrenal gland in secreting stress hormones. Thus both the ‘placid’ family dog and ‘docile’ farmed cow are far removed from their wild ancestors in temperament as well as physiology. Over the years, it’s been possible to select and breed individual farm animals with higher stress thresholds, greater ability to end the stress response fast, and low response to additional stressors. While some individual variation is unavoidable, there’s overwhelming evidence that genetics significantly contribute to stress responsiveness in vertebrate animals. For instance, certain pigs possess ‘passive’ rather than ‘active’ coping strategies to stress, Rosalind Hursthouse discussing how “exceptionally stupid” variations of naturally intelligent and emotional pigs have been bred to feel less stress in intensive environments. Selective breeding has also aimed to eliminate the gene associated with porcine stress syndrome (PSS). For poultry, selective breeding for stress resistance was first considered in the 1950s, and later six generations of chickens were successfully bred by W.B. Gross based on low-plasma corticosterone response to social stress. Muir and Craig subsequently developed genetic selection programmes to handle ‘hysteria in laying hens’, attempting to eliminate the pathological anxiety phenotype from the breed. Significant improvements in levels of fearfulness and abnormal behavior have been achieved by selecting populations against these traits. Despite these developments, there’s no firm consensus as to whether modification of stress responsiveness can significantly benefit an animal within an intensive rearing environment. Gross’ chickens were less stressed socially, but they showed similar responses to non-social stressors as birds that had not been selected. Even if science advances so that we do reach this point, the ethics of addressing welfare in this way are severely questionable. Matthias Kaiser considers the extrinsic ethical concerns of genetic modification in terms of ‘consequences’: reducing stress responses might allow animals to cope more effectively with the environmental stressors of confinement, but we need to consider why we need to manipulate animal genetics to enable them to cope. Selecting against abnormal medical pathologies like PSS in pigs is very different from breeding out the normal anxiety that any animal would experience in the stress of captivity. For Pottinger, the more appropriate strategy to reduce the stress experienced is to modify the animal’s environment to reduce the stressors. He believes genetic selection should only be an option “when no further improvements in the rearing environment can be achieved.” Given the increase in new research on positive affective states and related enrichments, it seems depressingly defeatist to imply that we have reached this stage. A morally troubling consequence of breeding animals to fit our existing systems might be a reduced incentive to improve these environments. Most often it is economic and practical restraints that prevent modifications to existing systems. By contrast, creating stress-resistant or physically stronger animals that can cope with increasingly challenging conditions has the potential to benefit farmers economically. We’ve seen that an animal experiencing stress can suffer from failed reproduction, altered metabolism, and suspension of immune competence, all potentially reducing profitability for the farmer. Reducing the “biological cost of stress” while maintaining the productivity of current intensive systems has obvious financial advantages. This is evident in the fact that, despite poor welfare associated with increased growth in broilers, there’s pressure on those concerned with genetic engineering to make such animals grow even faster, hence the silicon proposition. Breeding against the stress response in these birds or pumping them full of bone strengthener should not offer an excuse to do this. Profitability is not an ethically justifiable barrier to enhancing environments, nor is it a morally sound reason for producing stress-resistant animals. Indeed, philosopher Ben Bramble worries that by making seemingly beneficial welfare decisions for our own sake, and not for the sake of animals, we ignore the moral issue at stake. By modifying livestock to enable them to cope within existing systems, we’re not addressing the morally dubious part of humanity that’s responsible for our perpetuation of intensive farming. The fact that animals naturally struggle to cope in intensive systems suggests that there is something inherently wrong with the environments, not with the animals. The priority must be to improve these environments, rather than reshape the animals to fit within them. Another consideration is that while breeding against negative affective states, we’re failing to introduce positive ones. Jonathan Latimer argues for the removal of intensively farmed animals’ ability of tactile sensation through genetic ‘disenhancement’, allowing “for idleness without physical suffering.” Yet he’s only addressing half the story of animal welfare, the capacity to suffer, and downplays the significance of animal capacity for pleasure. As argued in the comments section on Latimer’s essay, suffering involves more than the ability to experience pain. Reducing a cow’s maternal feeling might alleviate the despair of separation-distress, but it also deprives her of the pleasure she experiences in bonding with her calf and denies that calf his mother’s comfort. Furthermore, a certain amount of stress is necessary to facilitate learning and allow the animal to experience ‘exhilaration’ (increased awareness, improved cognition, euphoria, and enhanced analgesia) so long as that stress doesn’t turn into distress. Reducing an animal’s capacity to respond to stress potentially deprives it of what Panksepp defines as the ‘seeking’ impulse, a major source of life energy. Diminishing the arousability of the affective system thus produces a similar psychological state to the persistent lowering of response to stimuli, comparable to human depression. This important welfare concern may not be problematic to many farmers or producers, but it’s hard to feel comfortable with breeding livestock who already have the ‘learned helplessness’ of those subjected to unrelenting negative stimulation. Is this moving towards the creation of masses of depressed animals, simply to suit our purposes? Shapiro already compares modern broilers to “meat-producing machines”: to reduce their capacity to feel pain in response to undeniably painful conditions or to feel an affective state, negative or positive, would seem a dangerous reversal of progress in our acknowledgment of animals as living, feeling sentient beings. Thus far, we have used science to improve efficiency in the most unethical of ways: we’re pushing farmed animals to their limits of productivity, breeding chickens to grow fatter, cows to produce more milk, hens to lay more eggs, beef cattle to grow more muscle; all to the detriment of their physical and mental welfare. Many welfare scientists will argue for new advances like silicon supplements for chickens and selective breeding of animals to favor genetic traits that allow them to better cope with the physical and emotional stressors in their captive environments. Selecting against abnormal pathologies like PSS has obvious benefits for the animal. However, selecting against what is essentially a normal stress response to, or physical effect of, an abnormal environment is problematic, adapting the compromised animal rather than the system. What if by breeding animals that are tailor-made for intensive environments, we are justifying the perpetration of what are ultimately immoral systems, systems that prioritize economics over the wellbeing of sentient beings? Ultimately, by genetically selecting more robust but less mentally alert or emotional animals, we’re reducing negative affective states but potentially depriving the animal of the capacity to experience positive ones. In light of recent emphasis on the latter in animal welfare science, this is surely a step backward.